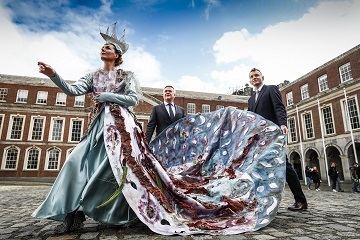 Launching the 2019 Allianz Business to Arts Awards, Sean McGrath, CEO, Allianz; Andrew Hetherington , Chief Executive, Business to Arts & Victoria Mc Cormack, Macnas at Dublin Castle. Picture Conor McCabe Photography. Today, Business to Arts and Allianz launched the call for nominations for the 2019 Allianz Business to Arts Awards, which champions the unique opportunities that business engagement with the arts provides. 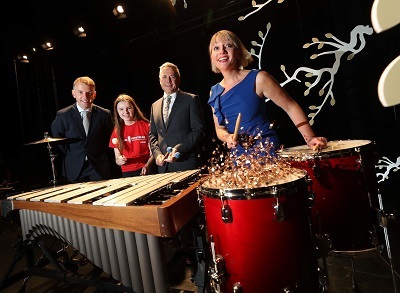 At the awards launch, Business to Arts and Allianz encouraged businesses from across Ireland to explore and strengthen their relationships with the cultural community and create meaningful partnerships. Previous award winners include Accenture, Bord Gáis Energy, Dublin Port Company, ESB and Bank of Ireland. This year marks the 28th anniversary of the Allianz Business to Arts Awards and Allianz’s 19th anniversary of involvement and sponsorship of the awards. Allianz is encouraging the business community to become involved again this year and to support and celebrate creative talent across Ireland. There are 11 categories in total focusing on sponsorship, commissioning, CSR initiatives and community engagement as well as mentoring, training and staff programs. The online entry form can be accessed through www.businesstoarts.ie/awards. This year also sees the 12th year of the €10,000 Jim McNaughton/TileStyle Bursary, which is open to emerging artist(s) in any art form. Previous winners include Aisling O’Mara (playwright), Clare Monnelly (theatre), pianist Máire Carroll (music), ballet dancer Gearóid Solan (dance) & sculptor Alva Gallagher (visual art). “The 28th Allianz Business to Arts Awards represents the crucial importance of the co-creative relationship between businesses and the arts community across Ireland. Over the last 28 years, we have seen inspiring examples of business and artistic engagement creating truly unique moments of courageous expression for communities and artists with a new voice or message. “In 2019, we look forward to recognising the exceptional creative partnerships that exist throughout Ireland between the business and arts communities. Alongside our partner Allianz, our Awards and mission is to encourage business leaders to consider the arts as a powerful and creative way to enhance community relations and to communicate social issues. We look to recognise these best-in-class relationships on September 3rd at Bord Gáis Energy Theatre”. Closing date for applications is Wednesday, May 1st 2019 at 5pm. Go to www.businesstoarts.ie/awards for information on the application process and to complete the online application form. Today, Allianz and Business to Arts published the 2018 Arts, Festivals and Music Sponsorship – Summary Report, following on from the success of the recent 27th Allianz Business to Arts Awards held at Bord Gáis Energy Theatre in September. The annual report, launched at the Irish Film Institute (IFI), was published by Business to Arts from data supplied by sponsorship and marketing managers from the corporate and cultural sector during the 2018 Allianz Business to Arts Awards campaign. This report adds to the membership organisation’s research and insight services providing an enhanced layer of insight and analysis for sponsors, rights holders and the public about this segment of the sponsorship market. The report looks at sponsorship objectives that differentiate the arts, festivals and music over other types of sponsorship areas. It looks at sponsorships that are both one-off event relationships or multi-annual partnerships; sponsorship spend between 2017 and 2018, as well as anticipated spend in 2019; methods used to activate relationships and how success is measured.